Finkle Laithe Self-cateringFinkle Laithe is an absolutely charming Lakeland stone barn conversion built in 1767 and converted to a high specification in 2000 retaining many original features including "arrow slit windows", latch doors, oak trusses, beams and lintels. Situated in the tiny hamlet of Matterdale End, it is a perfect Lakeland retreat for couples wishing to stay together or for one couple looking for a special destination - especially honeymooners! at any time of the year. Ullswater is within easy reach for steam cruises and quiet water sports - dinghy sailing, canoeing and fishing. There are great walks from the door, and a visit to the magnificent waterfalls at Aira Force is a 'must'. 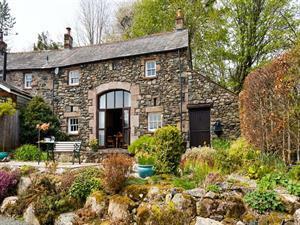 Finkle Laithe is an absolutely charming Lakeland stone barn conversion built in 1767 and converted to a high specification. Access to Keswick Leisure Centre. Ullswater for steam cruises & quiet water sports = dingy sailing, canoeing & fishing. Children welcome from age 4. Finkle Laithe offers weekly bookings starting on Saturday.